Transform tired eyes with the Smoothing Eye Contour Care from Embryolisse, an effective treatment to fight signs of ageing and reduce the appearance of dark circles, bags, fine lines and wrinkles. 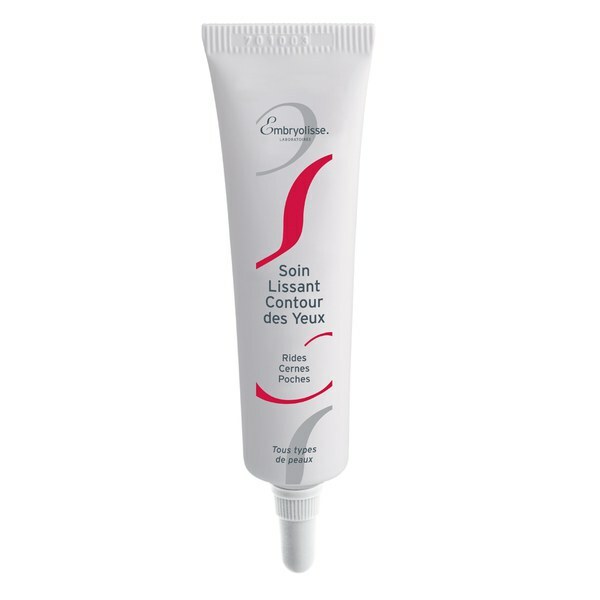 The moisturising treatment eliminates fatigue and smoothens the contours to brighten and refresh the delicate eye area. Specially formulated with hydrating hyaluronic acid and active plant ingredients, including sesame, cornflower and meristem for youthful-looking eyes. Suitable for all skin types and can be used underneath make-up. E.N. Use in the morning and/or evening; apply to the clean dry skin around the eyes with light circular movements. Aqua (Water). Cyclopentasiloxane. Triheptanoin. Sesamum Indicum Oil. Glycerin. Propylene Glycol. Cetearyl Alcohol. Cetearyl Glucoside. Aluminum Starch Octenylsuccinate. Glyceryl Behenate. Dimethylsilanol Hyaluronate. Centaurea Cyanus Flower Water. Polyacrylamide. C13-14 Isoparaffin. Laureth-7. Tocopheryl Acetate. Diphenyl Dimethicone. Sodium Benzoate. 1,2-Hexanediol. Caprylyl Glycol. Tropolone. Retinyl Palmitate. Arachis Hypogea (Peanut) Oil. Bha. Bht. Allantoin. Xanthan Gum. Citric Acid. Quercus Robur (Oak) Root Extract. Potassium Sorbate. Parfum (Fragrance).